Making the most of children's doctor appointments. Keeping good medical records for your family is one simple and possibly lifesaving thing you can do to avoid medical mix-ups such as allergic reactions to misdiagnosed medications. By maintaining up-to-date records of your family health history, illnesses, medications, immunizations, etc., other members of the family or caregivers can refer to records when there is a need to know on-the-spot information to assist in diagnosis. Know your family medical history. Ask your parents and your in-laws about their medical history and keep good records. Look at your past notes about medications, allergies, growth and development to refresh your memory. Do your homework first. Know what immunizations your children might be due for. 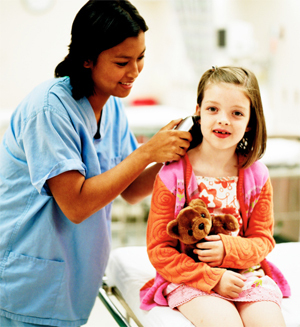 Read about children’s health issues or concerns using a reliable Web site or book. Talk to friends— you’ll be amazed how many people have “a friend’s neighbor’s sister” who had a similar medical condition that you can learn from. Know what options you have. Write down your questions in advance of your appointment. Start thinking about an upcoming appointment about one to two weeks prior to the date. As you go about your day, think of a question you want to know, and simply write it down. As more questions come, write them down. This way you are prepared and can have a more successful partnership with your doctor. There is nothing worse than getting home after an appointment and then remembering that important question you meant to ask, but forgot! Listen to your children. Watch for changes in behavior or complaints of pain, strange feelings or any other unusual changes. Take good notes during and afterwards. When you get home, do a mental checklist of what you spoke about and make sure you wrote it all down. As weeks and months pass, your memory of what was said fades and keeping notes jogs your memory. Know where your health and immunization cards are. Keep them together with your medical records at all times. You don’t want to show up without them or, worse, be frantically searching for them in an emergency. Plan to have a long wait. You never know how long it will be before your doctor sees you, especially if he gets called out for an unexpected emergency. If you have small kids, bring lots of nut-free snacks, beverages, books and toys. It’s better to play with your own toys and not with the ones in your doctor’s office that could have little Sammy’s runny nose dripping all over them! Understand your medications. Ask about possible side effects and watch for them. If there is a one percent chance of Sarah getting a weird rash— you can bet Sarah will get that weird rash. Phone your doctor and/or the pharmacist in the event of a strange reaction and read that handy insert that many pharmacies now give you about the medication you are taking. Keep it with your medical records for future reference and write down what the doctor prescribed. Keep your important phone numbers handy. Make sure your spouse/partner knows what’s going on. Share your detailed notes and medical information with your partner, especially if it’s possible that he/she will have to take a family member to an appointment. This way, if he/she does have to take the kids in a pinch, your spouse will have all the information at his/her fingertips. Parent and family health management expert Jodie Pappas created THE GET ORGANIZED! Family Medical Journal after one of her newborn twin girls was born with a medical condition that required ongoing treatment and surgery. While attending numerous doctor’s appointments at the Hospital for Sick Children in Toronto, Ontario with a variety of specialists, all who kept different records, Pappas decided that she needed a way to keep track of medical information for her family. For more information about Pappas and THE GET ORGANIZED!, visit www.getorganizedjournals.com.